Just found picture of your earth daughter Mo Mo, she is with Danny's family living a life of a princess...you have your boys pay tribute to you every morning and evening with their paws....Mo Mo is so far away, here is a kiss for Dady and to her sisters Angel and Angie! Mom miss you all so much! Oh my goodness - what a precious photo - soooooooooo sweet!! So precious, little Mo Mo giving her handsome daddy a sweet kiss...just love this picture of them together! Is Mo Mo very young in that picture? Thank you for sharing - great idea for those little angel girls (Double A girls!) of Bedo's to pay tribute with their paws every morning and night - a wonderful tradition to honor their beautiful daddy! See how many hugs and kisses you all have from your mom, sweet earth and heaven angels - she loves you so much give her lots of affection and comfort she needs your magic touches and lovey very much. Ai Yah, Little B is 1/2 Chinese and my writing in English is so limited, I can only use simple language, not really that profound! Auntie, you just want to put little to B to Cloud Nine and you are forgeting that Little B and Buddy are already living There with all of our angel friends! Auntie, I have found my two little Angels the double A Girls and now we are a family of AABB, that's so special. Thru our spiritual connections, everything is flowing naturally to form something that is very profound that takes us to a next level of life perception. We angels are working very hard to send these sweet messages to our earth parents that everything is going to be ok. I know Christmas holidays is around the corner and it is going to be very hard for all of you two-leggeds..If you include all of our sweet spirits to the Christmas sprit for celeberation..then things will be all right...Just like God is always in our hearts and we celebrate his legacy every Christmas - We Angels want to be part of that too, we don't want to be forgotten as we love our moms and dads so so much! Auntie, Buddy knows your love for him is as deep as the deepest ocean..your tribute to him to Golden Rescue Website is so sweet. Mom loves Golden babies because she thinks they are gentle giants, and she thinks we shorties are too sneaky...I am Jealous of Buddy sometimes but it is ok, I have your love too that makes us even. Auntie, me and Buddy always want you to be at peace, and please remember that we have plenty of love inventory as our most valuable asset. My silly mom always want to put accounting terms in everything....like the love principle, etc...Oh I start teaching Big B some of the Chinese Culture and he is learning to use chopsticks now. Auntie, if you have time, you can read "The Good Earth" by Pearl S. Buck, mom came accross this book from a garage sale, when she was about 14 years old. She read and enjoyed it so much, she did not know this is book was that famous as it was made into a movie played by The Late Paul Newman, He is also an animal Lover too. Hugs to you sweet Auntie from Big B and little B and my Double A Girls! The last two days have been very very cold, Little Elvin The Chip Munk has short hair and he is shaking when we go for a walk. While mom was looking for a shirt for him to wear, mom found your old tags and your black collar from Ontario, yes that was back in 2006. You gained a bit weight after living with mom for a while and mom had to put them away and mom wanted you to wear a harness for comfort in walking. The two tags from City of Brampton and City of Mississauga and the little bell make a very very familiar ring tone, mom would say Yes, it is the Beed Beed Ring Tone; you sweety were mom's first pet, when mom first got you, you used to walked around the house, discovering your new residence endlessly with your short legs walking in that cheerful ring tones, it was like a jingle bell sound in Christmas... .how mom misses that baby, you made us know exactly where you were with that ring tone, when you wanted something or hated something, you came to us with that ring tone...the house is empty now as there is no "us" just your old lonely mom and how mom misses that Ring Tone...It is such a sweet reminder of you, mom puts the collar on mom's wrist and walk around the house with that sweet Ring Tone, it is you my baby, you are back completely as mom's wholesome sweet Bedo; When mom goes for a walk with Bowie, Elvin and Trina, mom carry that collar on mom's wrist...yes baby, you will be able to walk with mom every day in the similar path again...after 7 and half years, you must have been so familiar with every root of each of the plants, the trees, the corners that you have marked with your short leg lifting up to its cutest gesture.....mom also takes you to your favourite park where your favourite bush lies still waiting for Beed Beed ...My Baby, Thank you, Thank you for reminding mom that you are still here, very much prescence with you sweet persistant spirit....Mom loves you! Hugs to you and my Double A Angels Sweet kisses to Cloud Nine! Your sweet Bedo will always be with you, for you will always carry him in your heart, and I believe that their spirits stay close to guide us as we travel life's road. I am sure that your Beed Beed is happy going for those walks with you, and visiting all the familiar places that you went while he still had his earthly body, for I am sure he walks with you in spirit. There are so many memories that he left behind, and he left behind a wonderful legacy in his sons and daughter. I was home alone tonight feeling so so sad and alone crying, missing and thinking of my girl. I have read through your story and wanted you to know you have the sweetest words for your lil guy. I think you were both so very lucky to have each other. He has the sweetest little face and I'm sure he is with you now, knowing how much you love and miss him. Sending you a big hug from California, and please know you are not alone. Jamie... I love you sweet girl. That is so sweet that Bedo led you to find his collar and tags - his "Ring Tone" - he is definitely wanting you to know that he is still nearby and you are never alone. I'm sure that familiar sound brings sweet memories and comfort to your heart. What a clever boy he is! Thank you Beed, for working so hard to get your special messages through to us two-legged mom's...it takes us awhile and sometimes messages get missed, or they don't sink in as quickly - we are slow learners compared to you guys! I am so happy for you...your double AA girls are with their poppa, you must be so happy being with them again! I know Beed, you have a little jealousy when it comes to Buds, and maybe because your mom loves him so much, has grown so fond of him being the golden gentle giant type, but you know you have Auntie's love all the time now, so it really does even out! I think maybe Bud Bud a little jealous of you sometimes too, Bedo, because he knows you are very clever and Buds was always smart but not in such a clever kind of way so you kids all have your specialties and areas of excelling. Oh boy...I can't wait to see Buds eating with chopsticks! I had a feeling you were going to teach him how to do that! This is good, as it will help him slow down his eating...he was always one to gobble everything up so quickly...(after getting his kisses first, of course)...so this is definitely a good thing - thank you, Beed! Until next time, enjoy your new cloud hopping game! Beed Beed, Bowie, your weet son is a Friendly Giant, he is being bullied by all the little ones; He kisses Minnie and got scolded by her after that. You can see who is the boss! Everytime I call out "Tribute time to dad", your sons, Bowie and Laughing would come right away, they know after that, they are going to have their meals, after you of course. Your boys are good babies, so is Trina, Minie, Tropi and Elvin. We all miss you so much! Kisses to heaven from all of us from home! Sending his Love, Keep me warm and loved! A penny from heaven - what a wonderful sign from your sweet boy - he loves you so much and you have a wonderful, blessed connection with him Sweetie - I pray your sweet little Sunshine will continue to guide your way. I'm sorry for your trouble and for the evil of human kind - if we could only take lessons from these pure loving little souls, our little babies - this world would be a much kinder place. Your "Sunshine" poem for little Bedo is so beautiful - we truly do love them beyond their Bridge Day....always and forever. Hugs to you too - I will keep you in my thoughts and prayers. Mom here, just let you know that since you had left to the RB, Mom has not doing much, mom's favourite clothes are jammies and robes, laying in bed, staying home just thinking of you....Life is not the same, nothing matters anymore. Just thinking of you would give mom most comfort. Mom only goes out for groceries gets what mom needs and come back home like a zombie. Putting make up is the last thing mom would do. Laughing has been very supportive and he comes near mom and kisses mom whenever mom is sad, just like the way he used to take care of you...Baby, mom is in tears now, mom misses you so much, you, mom's first baby, mom's first love....The website keep emailing mom, offering discount for natural cancer treatments and health products, we don't need them anymore.. but how mom wish mom could order some for you, for mom's baby, to make you feel better, to make you staying longer with mom - now we are one from heaven and one from earth, baby, do you think of mom? mom wants you to look at mom, remember mom's face, mom's eyes...mom's love, remember our "one in a life time love connection" mom loves you more than anything else in the world and mom is thinking of you every second. Today, mom just ordered a paw print necklace and some other products from Pet charities, mom know that having them will give mom some comfort- Baby, How are you up there, mom miss you so much from mom's morning walk, mom remembers the momment you had frosbites when there was black ice on the side walks, mom had to buy boots for you but you hated walking with them, these pink boots are still here, mom will keep them for memories of you! Baby, mom misses you so much my good old sneakiest soul...there is one fly that is in mom's bedroom all the times, he was at mom's cleaning cream and face cream this morning, is that you mom's angel with wings?Mom needs you so much! Laughing sends his love! Dear Nance, Your pics of you and Bedo are beautiful. Poms are great little smart kids who are very much like little humans! I know your pain. Please be easy on yourself and take your time to grieve. There is no time limit on our grief and for each of us it is different. I pray you find peace. Love, Diane, Mom of Miss Dallas at the bridge over 11 years. What beautiful pictures..Bedo is so handsome. I bet my Girls have met him..knowing that you had I have met and share our love for our babies and our sadness for their passing. It sounds as though you had a particularly tough day...for some reason I did as well...I woke up already sad...and have had several outbursts of crying....tomorrow is Dec....I just can't believe time keeps passing and stuff still has to be done..I too go and do what I have to do..then come home to be with Winnie...but I just feel sad, sad, sad. I love the pictures of you and your sweet little guy. Soooo cute. I love the way he is nuzzling into your chest. Look at how much he loves his sweet Mommy. You were both very very lucky to have each other, just as Patches and me were. Its just so unfortunate we cant have them here longer. I miss Patches deeply Bedomom. I still cry everyday, not as much as in the beginning. That makes me sad. I talk to her all of the time out loud too. I still cant stand not seeing her, holding her and loving her. She's my baby. I know how much you love and miss Bedo, he knows too. I can picture him in his cute little boots. Oh Sweetie, you break my heart - life most definitely is not the same - never will be will it? Life is completely turned upside down - things that used to be important and capture our attention - are just so insignificant now. And Sweetie - Little Bedo DOES think of you, he remembers your love - he is sending you pennies from heaven and watching over you in disguise as a "mini" angel in your bedroom. Lee Lee came to me as a yellow butterfly today - I think that they come in these other little beings because they know we would probably completely freak out if we saw them in their normal bodies!! Little Bedo is so adorable in his orange sweater - I know you are just missing him so bad - just their presence provided so much support and comfort. He was just so incredibly special. I just love that beautiful photo of you two - his little head laying over against you - he obviously adored you and you him. I am so sorry for feeling so down, I was all by myself in the office today, I saw so many things that reminded me of Beed Beed. One of our client had caugh him marking on his bag (Bedo had a thing for bags), and the bag was still in the storage room. I just broke down and cried so hard to the point that I had a chest pain..no one was in the office so I just cried and cried uncontrollably, I miss him so much as he used come to work with me all the times. Diane, Yes, we will meet our angels again at a much better place, Thank you for your comforting words as a Pom Mom you surely know how much a little human beings they are! PatchesMommy: The pictures of you and sweet Patches just just beautiful, how time flies I know you miss Patches so much, I know Buddy, Lee Lees, Max, Dallas, Beatrice, Ellie and Elizabeth and all the Senior Angels will take care of Patches. I will ask Bedo to have Patches send you some signs, she may need sometimes to settledown. I am sure sooner or later, you will get signals from her. LeeLeesMama: You are always so sweet, The little one I am holding is Laughing, Bedo's son, he is about 3 years old. The picture has just been taken two days ago. Laughing always jumps up to my bed and snuggle with me if I am sad (The boy can jump quite high), and if I cry, he would kisses me. When I am ok, he would just lays at the end of the bed, facing Bedo's place. He is taking care of me exactly the same ways he was taking care of Bedo..in a way, I am blessed for having him. It is a blessing that Lee Lee comes to you as a butterflies. I don't want to sound obnormal, but I saw 3 pennies at the very same spot today, and after a couple of paces up, there were two others? I know in Canada, we have got rid of the pennies a while ago, but people would not throw them at the same spot? Thank you my dear friends, you all in my thoughts tonight! Aunt Esa so sorry for mistaking you for your son Laughing in the picture, A thought this was an older picture of your mom holding you! Please forgive me for being mixed up! I'm sorry I got your babies mixed up - Laughing is a precious baby too - I'm glad he is watching over you in his own special way. No need to apologize, it was my fault that I posted picture with The Laughing Boy as I want Bedo to know that he is taking care of me and I know this is quite confusing! What is more abnormal is, I do keep the Six pennies, right beside where Bedo is resting. Before this morning walk, I have this thought in my mind that since I have six babies and it does make sense that Bedo wants to send one to each of them. Later on, I was thinking about myself and that means we are short of one penny. 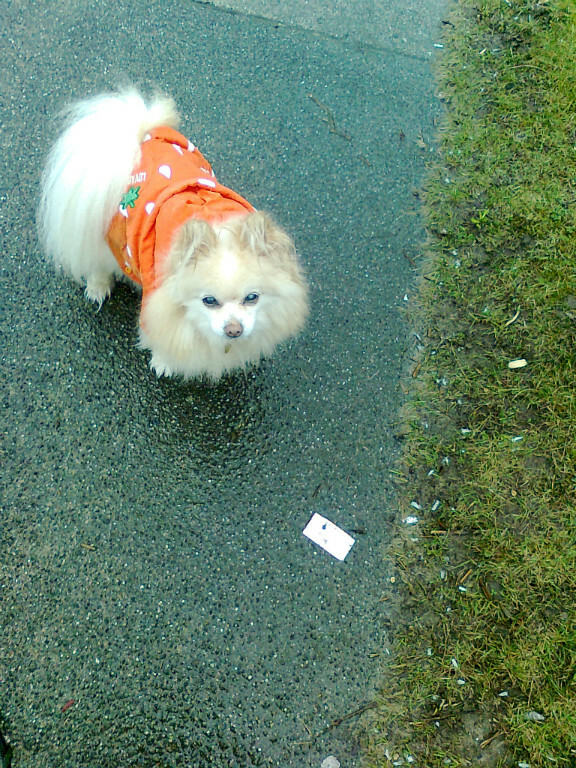 Guess what, I found One more penny laying at the very same spot at my morning walk... I have total 7 pennies now. I swear I picked up all the pennies 2 days before as I knew they were from Bedo, and it was bright morning and I would not have missed it. The penny I got this morning is at the very same spot near a place when some bad owner did not pick up his mess so I could not have missed it. Can we figure this out LeeLeesMama? you had signs from Lee Lee so you know that I am not crazy. My boy was like a wise old man in his fur suit and now is is a very wise soul! I just found out from my sister that he had so many different homes before he came to me. Hope you have a peaceful night. You make Little B worry again dear aunt Buddy told me nothing really matters any more he knows you love him with all your heart that is what really matters mom's class mate was a weird one mom asked him to move out as he constant told mom to get rid of us mom told him that mom needed time to find good homes for my babies but he did not have the patience mom asked him to move out mom was quite cool one time he hit the brake so sudden that it almost made me fall she was a bit upset with him and he was mad as he thought mom loved me more than the two legged and mom was obnormal he was more like a kid with wrinkles and I am sure she is better without him she had sacrificed for him so much and he was being so selfish some times little B wonder if it was my fault due to their break up but mom is so sure it was not little B's fault mom always think she had to speak out for us because we poor four legged can not talk we need deep mutual understanding from you two legged mom says if she ever meet a man again he has to be understanding and loves animals if not she will be just as happy with us four legged mom is cheap as she is an accountant but she spent money on me when she thought it was necessary she spent money on me when I was sick but she saved money on luxury things such as grooming she never brought me to the groomer may be she thought that I was cute enough she used natural remedies whenever she could. Sweet auntie please be guilty no more can she promise little B this? Our boys know you have a tough life just like mom and we want you to treat yourself right promise little B and big B to take a good care of yourself physically and emotionally we love you so much and we want you to lloves yourself too. Ok little B had to go cloud hopping now I need to exercise to maintain my good look Buddy is working out a lot too I love Buddy so much as he is such a genuine Canadian I am more or less like a street kid and I don't trust people easily I only trust mom, you my sweet aunts and all the sweet moms and dads from our family here. It has been two months since you had run off to the RB without telling mom baby you had always been such an old soul mom wants to thank you for the 7th lucky penny you sent mom this morning will you come to mom's dream tonight? Mom wants to give you a big hug and scratch your tummy as you had always love that baby mom misses you so much every time mom wallks to the middle room mom would recall you jumping in mom's luggage as you knew it was our last momment on earth mom remember that momment mom wrapped you in mom 's arm whispering in your ears that mom loves you and would be back home soon baby I am sorry and mom wants to say mom always always love you my one and only special baby sometimes mom still wonder why would people would abandon such a handsome guy like you mom heard stories about you in your earlier days when you saw a bunch of kids at the beach and you immitate what they did that was so cool will you come to mom's dream and let mom know more about mom's beloved baby? Have a blast Little One! Love you always! How awesome! - 7 pennies - what a clever little boy! I've had so many signs and messages from my Lee Lee - it seems she can "hear" my thoughts sometimes - just like your Bedo - you wondered about being short 1 penny and it appeared. It could be nothing other than a gift from Bedo to you. That has happened to me - not with pennies, but with other things - somehow they just "know". Way too many things and signs for it to be mere coincidence. No, you are not crazy - you are a grieving Mom who has an extraordinary connection with her baby. It is wonderful to hear about your signs - please keep sharing - it helps me so much to read of others who receive these precious signs and gifts. I am so glad that after all his many other homes little Bedo finally found his true home with you - what a blessing for you both. Love love love you mom's Beed Beed! You are blessing your mom so much, to come in her dream and letting her know you are with the other angel babies...you are always by your mom's side, she is very proud of you, little B, thank you for placing the 7th penny for her to find! She is saving each and every one of them, for her keepsake and treasure store from you, her sweet son...she loves you so much, little nephew! OK Little B, you have asked for A's promise so now I must give it to you. Auntie promises to let go of any lingering guilt, for your sake and Buddy's sake, too. Auntie needed you to ask, especially for this favor as she would have continued on and on chances are...running herself down into the ground with blame. It is not what you want, Little B and Big B and Auntie respects that, and will truly try her best to put the guilt away, once and for all. Little B, you know about Lee Lee and how she blessed her mom with her visit as a little yellow butterfly? You kids are so amazing with the little signs...Koji's mom and dad had a conversation with a leaf, which embodied Koji's spirit, Zhea's mom felt her close, and knew that her baby was OK and communicating directly, in her sweet telepathic dream, and then confirmation of her presence with the flickering candle. We see how you kids find all kinds of creative ways to let moms and dads know that you love us, never abandoned us or forgotten us...we cherish these little signs, signals and dreams...some kids are still learning and finding their way with the signs, but you can help them you and Buds and Lee Lee as you are becoming pro's at the signs! A is so happy you are staying in shape with the cloud hopping - please don't let Buddy wander off too far...you kids stay together, A knows you can't really ever get lost but sometimes Buds goes off on a tangent even though he is Chief, make sure he stays with the gang! Love you so much Little B, thank you for comforting your mom with the pennies and through your sweet boy Laughing - big hugs to you, to all the heaven kids in your big gang and to your sweet mom! I've read through your story about Bedo. He had such a loving, sweet mom. I know how much you love your baby. It really touches my heart and I love the photo of you and Bedo... there is so much love in that picture! It is bursting with love and adoration between the two of you. I know how you feel when you say you can't even think of doing your makeup and you lay in your pajamas and go to the grocery store like a zombie. That is how I am at the moment too. It is so painful without our babies and so hard when you're pulling up to your house and realize your sweet baby won't be there to greet you at the door like always. It's so much to get used to. The holidays are around the corner and like you said, yes, it's going to be difficult. I am sending you warm hugs. Just know you aren't alone and try to find comfort in the fact that you gave Bedo such a loving home and he knew he was loved by his sweet mom. You will see him again. Thank you Bella's mom for your comforting words I love your tribute to your angel Bella I know you love and miss her so much and her trip to the RB has been hard on you .....I know because of your deepest love for her. Now she is forever remembered as she is a part if our family ! She has a little cozy home made by her sweet mom and she will be there watching out for you! Baby, the lecture today was very interesting, after so many years invested in tax and accounting education, mom realizes that mom needs to capitalize this knowledge; mom can not be a zombie anymore, mom needs to pick up life where it was left. The fact that mom is not killing mom with sadness does not mean that mom does not love or Mourn for Beed Beed, mom just wants to make mom's boy Proud! together we mother and son team will work things out. Mom loves you, loves your babies, Trina, and the two adopted daughters Minie and Tropi,mom will take care of them and give them all the best! Baby, you promise mom to be a Good Angel from the Above, and your mom will also promise mommy's boy that mom will be a good human being down here; by having more knowlege and strength, mom can have more abilitty to be a better human being; does this make sense mom's Sweet Son? Lots of love, hugs and tummy scratches to mommy's Boy, see you in mom's dream! Winter 737: Thank you for dropping by, yes, we all feel the same about our babies...very very close! I know you still miss your girl! She knows you love her! Mom started cooking Brown rice chicken congee for the kids last night, the same pot mom used to make plenty for you before that fateful vacation on September 21 with the same ingredients that mom thought would be good for your health..Carrots, Lean Chicken, Sea weeds... Baby, it was so hard to do the same thing that resonates of the past...just about 2 months ago...if mom can turn back the clock, things would be so much different...Baby, the wild salmon that mom bought just specially for you are still in the fridge, mom is afraid to touch that package now...looking at it would just bring pain the the heart knowing that they are my Baby's Food, what should mom do with them? they are suppose to be for you! Mom knows that mom has promised you to be strong, to make you proud but it is easier said than done...the cold winter also reminds so much of you, your frosbite when you just froze while walking had scared mom to dealth...and you cutie shortie's foot prints in the snow...baby, mom just miss you, and mom is thankful to have the lively picture of you in the corner of the bedroom..By looking at it, mom feels like you were still here and mom talks to you eveyday, it sounds a bit crazy but mom does not care...mom's heart knows what is right because mom loves mom's baby so much the overflowing of love deep in mom's heart needs to be expressed somehow...so much love that could fill the deepest ocean! so much inside that has to be cleared by tears, by loving thoughts and by honouring you mom's Sweet Boy! Beed Beed! Little B knows the Holidays are comming and the weather is getting cold, going through Buddys' stuffs is hard for you, Little B knows, Little B understands sweet A! You miss Buddy so much...every little thing of him reminds you of all the sweet memories you had have shared; Buddy is so huggable and you are missing his warm hugs and kisses. Dear Aunty,We B boys are sorry for you feeling so hard for Buddy, We love you with all our hearts and soul, even my earth babies say you are the best A in the whole while world! Sweet Aunty, you know that Buddy loves you so much, he had never have enough of your love, He wanted to stay but it was heaven's call when he had finished his mission of love. He is Thankful that you have rescued him and gave him a very sweet home. Your action has proven that there is hope on earth. Little B does not know why there are still people on earth would neglect us, Little B is so cute so is Buddy, why would people abandon us before we found Mom and You?- See Sweet A, it was better late than never, Buddy was blessed to find you and I was Blessed to find Mom; The earth is such a hug universe but we had have found each other? was it wonderful Auntie? Little B wants you to think about this miracle seriously and remember that is our B boys' gift to you for Christmas. By having found us, you and Mom had found love and we feel the same. What is a greater gift than this, feel sad no more Auntie, Little B and Buddy promise you that this love will last forever and this love will be with you every step of the way until we meet someday. Please be healthy, be happy sweet A..what you are experiencing now is just a process of your earthy challenge..Little B knows you will do well as you not only have a big heart, but you also have our angels wings are embraced you tightly...Little B is such a shorty but Little B has a big heart too, together our B boys will make sure our sweet auntie is healthy and peaceful always...Take care sweet Auntie, the weather is getting cold and don't let us B boys worry!